THE CONSTANT-CONSISTENCY ALVEOGRAPH METHOD—HOW DOES IT WORK? The AlveoConsistograph helps you to classify, control, and select wheat and flour and to optimize their blending for specific rheological properties. It measures the effects of improvers, ingredients, and other additives, resulting in better control of dough on the production line and more consistent end-product quality. 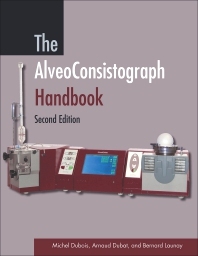 The AlveoConsistograph Handbook, Second Edition provides an understanding of the technical data generated by the instrument and gives timely application examples. It explains the workings of the Chopin Consistograph and provides deep insight into its coupling with the Chopin Alveograph. As the first revision of this resource in 20 years, this new edition explains major modifications and improvements of the alveograph through new and completely revised chapters. A new chapter on the Consistograph, the component used to determine the water absorption capacity of flour, includes test procedures, applications, differences from other devices, maintenance, and troubleshooting. Another new chapter discusses the debate surrounding the testing of samples using either constant water content or constant consistency methods. This chapter gives useful insight into the adapted hydrated alveograph protocol and its benefits for users of flour that will be part of formulations when gluten quality and performance is crucial. It covers the controversial subject in depth, along with the technical basis for the development of the debate, and compares the uses of both methods on the same wheat. In addition to wheat flour, the book provides guidance for using the alveograph on additional products, such as durum wheat semolina and durum pasta. All the chapters have been rewritten to include the latest practices and will help users gain a better understanding of how this important technology is used in today’s food labs.